The cartoon strip I love best is 'Peanuts'. 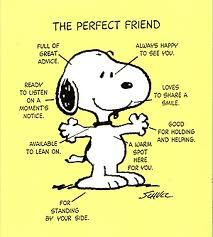 Time and again I have used Charlie Brown or Snoopy the Beagle in my posts to highlight certain qualities I uphold - or wish to uphold. 'Peanuts' is not really a cartoon strip for children - or rather it is for children who can think like adults. But one can enjoy Peanuts at any age, though the philosophical implications might escape the notice of many. One of strips that I find unforgettable and that I go back to from time to time is given below. Sometime in the Eighties it had appeared in a Weekly - I had cut it out and kept it in my treasure chest. When K came from Bangalore last week, as usual he presented me with a secondhand copy of Peanuts book bought from Blossoms. To my great delight, I found the strip in it. I would like to share it with you. He he he he .. now that was indeed wishing for too much by snoopy dear ..
Haha. That's a great one. And only Snoopy could time it like that. Was always a fan of the strip, and would await it in the newspaper back-page.